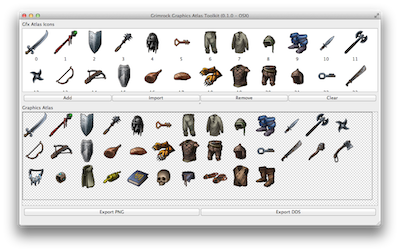 The Grimrock Graphics Atlas Toolkit is a small utility that was created in order to pack icons for custom items into ‘graphic atlas’ files. The software is written with 'Qt', a cross-platform C++ GUI library, so will ultimately be released on OSX as well as Windows. Add individual icons to your atlas in PNG/TGA/BMP/JPG format (although PNG is really the important one). Icons smaller than 75x75 will be centered into the next slot, icons bigger than 75x75 are shrunk down and icons that are exactly 75x75 are left untouched. The number beneath each icon in the editor is the gfxIndex that you will use in your scripts to access those items. Export your finished atlas as either a PNG (which can easily be reloaded into this app, and automatically sliced up into icons again) or a DDS ready for the game. Generated atlas will always prefer going up to 1024 pixels wide first, to get around the indexing bug in the engine (so the indices will always work, instead of skipping indices for atlases of other dimensions. If you are getting the error: "MSVCP110.dll is missing from your computer" then you MUST install the X64 / 64-bit version of the Visual Studio 2012 DLLs and install them. These are official Microsoft DLLs which are required for any 64-bit applications built using the latest version of Visual Studio. Last edited by JohnWordsworth on Tue May 28, 2013 5:05 am, edited 1 time in total. My Grimrock Projects Page with links to the Grimrock Model Toolkit, GrimFBX, Atlas Toolkit, QuickBar, NoteBook and the Oriental Weapons Pack. Awesome. So can't wait for it. "I'm okay with being referred to as a goddess." Message me to join in! This will be really helpful. It's a bit fiddly to get it right as it is now. Can't wait, this is something I could really use. 35,000 files left to download in Dropbox and then I'll be able to compile it (granted, I could do it manually, but I've not had the time anyway). I'm hoping to send out an initial release for Windows this evening / tomorrow evening! 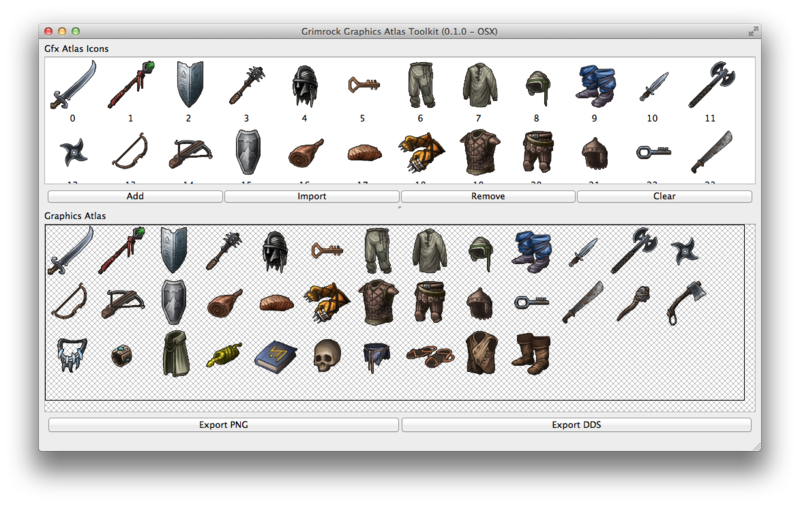 Release Announcement 0.1.0: I'm happy to announce the first build of the Grimrock Graphics Atlas Toolkit! There are some hoops to jump through at this early stage (and you might have to do some other things too that I don't know about yet). Requirements: You need to have a 64-bit version of Windows to run this app. If this is a problem for anyone, I can compile a 32-bit version too. I just downloaded the 64-bit version of the Qt package and haven't got the 32-bit one yet. Equally, if you would like to use this on OSX, just let me know. 1. Download and install the Visual Studio 2012 Redistributable Package (X64): (Thank you Juho for pointing out that this is needed!) You might already have this installed if you happen to have installed something on your PC that was built with Visual Studio 2012. You can either run it anyway and it'll do nothing, or you can try to run the app and install this if you have problems. Visual C++ Redist 2012 (Click download then _X64 version). Private Mirror - If you just want to click one link. 2. Download an unzip the GGAT files. At the current time, there is no installer - just double click on the .exe file in the zip and it should run. There will likely be problems, as you are all 'alpha' / 'beta' testers at this stage! If it still doesn't run due to missing DLLs, please let me know. The problem is - my laptop has all of the DLLs installed in the system folders already, so I don't know what's missing. Last edited by JohnWordsworth on Fri May 17, 2013 10:55 am, edited 1 time in total. "MSVCP110.dll is missing from your computer." "The application was unable to start correctly (0xc000007b). Click to close"
Thanks AdrTru (and Marco for your feedback on Skype); I've uploaded GGAT version 0.1.1 (and changed the link above) which should now come packaged with the Qt platform dlls that weren't being copied across properly into the bundle automatically. AdrTru: It sounds like you need to install the Visual C++ 2012 Redistributable files. Specifically, if you download the file (vcredist_x64.exe) either by going through the Microsoft link and selecting the download there or just downloading it direct from my mirror, then just run that .exe file when it's downloaded. It will install a bunch of common DLLs that are required to run any app that was made with Visual Studio 2012 (the latest version). As VS2012 is still quite new, it's likely that you've not needed these files until now. After instal VisualC++2012 and download new version, program running.